Don't act! You've yelled Yee-Haw before and don't say you haven't. Even if you yelled it in the shower you've done it. If you 6 or 86 you know who owns the Orange car running from the blue lights of a crooked government with the weakest K-9 in law enforcement history. Yes the General Lee from the "Dukes of Hazzard" but you knew that right. 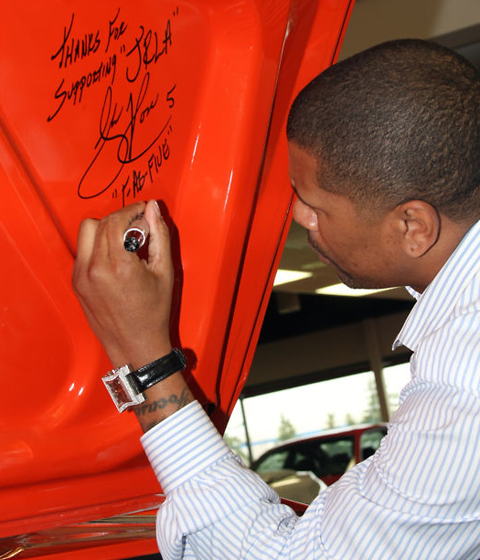 Well Fab Five Alum Jalen Rose has owned one for the past 10 years but the time has come to give it up to support The Jalen Rose Leadership Academy which will open in the fall. If the car that made it's mark racing from Hazzard to Capital City to catch the dumbest criminals in any country-side can aid the development of youth in the city, hey sell that thing. Well don't sell it but auction it off. What NBA player owns Knight Rider, thats next to hit the auction block?